Islamabad (Web Desk) – In a bid to fulfill International Monetary Fund s (IMF) target to keep FOREX reserves on a specific level, the government withheld payments to Pakistan State Oil (PSO) which led to fuel crisis, Dunya News revealed in its investigation report on Monday. Before issuing another installment of debt to Pakistan, the IMFset a condition to maintain FOREIGN EXCHANGE reserves on a specific level and for this purpose, the government stopped payments to PSO for the month of December due to which the state oil company faced economic crisis, leading to scarcity of petrol in many areas. IMF is expected to carry out Pakistan s sixth economic review on January 27 during which it will evaluate fulfillment of conditions set in the agreement. Afterwards, the International Monetary Fund will issue next installment of debt to Pakistan. On seventh day, widespread fuel shortages have raised tempers all across the country. Scuffles at fuel stations in major cities were reported as hundreds of cars and two-wheelers lined up for petrol and diesel - fearing that existing stocks would run out. 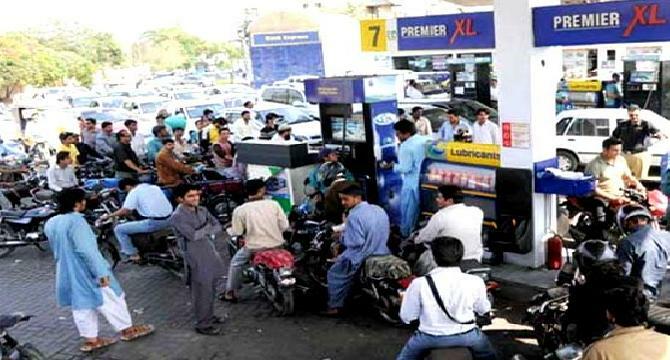 Many motorists in cities such as Lahore, Faislabad, Islamabad, Sialkot and Multan spent the night queuing up at the handful of petrol pumps still open. Several ministers expressed regret over prevailing situation and admitted government s inefficiency. Interior Minister Chaudhry Nisar stated that he feels ashamed when he sees long queues of vehicles outside the fuel stations. Minister for Railway Khwaja Saad Rafique has already apologized over the inconvenience caused to the masses and signaled that the government would take stern action against those involved in the crisis.